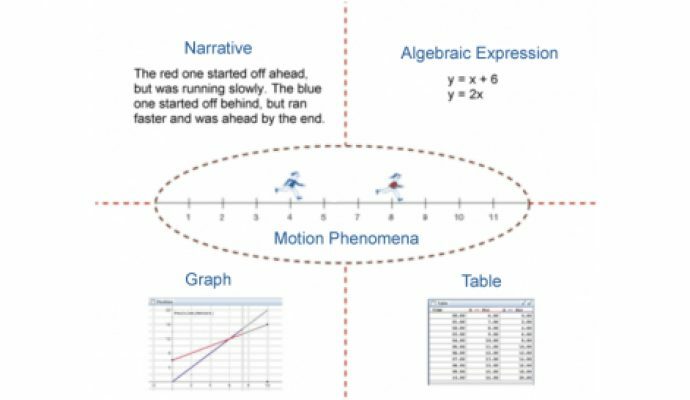 SunBay Math engages learners in complex mathematics with graphs, tables, equations, and pictures in motion. Middle school mathematics achievement lays the foundation for students’ college- and career-readiness and long-term success. SunBay Digital Mathematics’ integration of curricular materials, technology, and teacher professional development helps schools meet this critical objective. The program’s 80 hours of professional development guides teachers to further integrate the units’ foundational concepts and the technology to cover additional standards. Professional supports include workshops, in-class experiences, and coaching. "The dynamic technology helps bring the math to life for students." "It is a great way to teach that keeps the students engaged." "It is an excellent visual to help develop certain math concepts. After manipulating computer activities, students end up with deeper understanding of certain concepts." Students taught with SunBay Digital Math learning modules showed consistently higher learning than students taught by traditional means. The gain in learning was large enough to move the average student from the 50th to the 80th percentile. NGLC funding enabled the SunBay Digital Math team to provide professional development for 26 teachers and introduce the learning modules to approximately 1,200 middle school students. The team conducted pre- and post- student testing, too. Ongoing Projects: The project team continues to develop a curricular activity system of CCSS-aligned, learning modules for key concepts in grades 6-8 mathematics and Technological Pedagogical and Content Knowledge (TPACK)-based professional development for teachers. In addition, SRI has conducted a related project in England, Cornerstone Maths. And a 2014 Investing in Innovation (i3) grant will enable USFSP and its partner, SRI, to expand SunBay Digital Math’s availability. Long term Goal: For SunBay materials to be used by every middle school teacher within a district partnership.